HORSLEY: It certainly has that potential. You now have five conservative justices appointed by Republicans, four liberals appointed by Democrats. And to the extent they rule along partisan lines, that — they could come to be seen as, you know, partisans in robes, not impartial arbiters who rise above politics. The court itself tried tonight to make a show of unity. 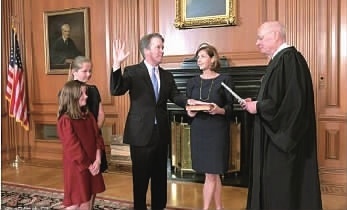 All eight of Kavanaugh's fellow justices were at the White House to make a stand that way. Kavanaugh said he knows and respects all of his future colleagues, and he promised that he would be a justice for all Americans. But the president's tone was much more partisan, and Donald Trump lambasted the Democrats who led the fight to keep Kavanaugh off the bench. CHANG: That's right — with the nominee Merrick Garland. What was the purpose of tonight's event at the White House — because Kavanaugh was already quietly sworn in on Saturday shortly after the Senate voted to confirm his nomination. So this was just kind of a repeat of that. They agreed to draw up a formal agreement. No matter what you determine to do, I would si﻿de with you. He built the company through a string of well-timed acquisitions. He has endeared himself to the American public.